Good morning from beautiful Hamburg and welcome. Today we will report about the strong EUR and we have comments from the euro zone about the actual situation concerning the EUR. However, we wish you a good day. The USD traded near to the lowest level in more than one year versus the EUR and reached 1.4992 as signs the global economy is recovering boosted demand for higher yielding assets. The EUR climbed also against the JPY for a ninth day to 135.67 as Asian stocks continued a global rally and before reports will show that the U.S. housing market and the German business confidence improved, damping demand for the JPY as a shelter from the recession. The AUD touched a 14 month high against the USD and reached 0.9311 after the central bank of Australia said that it is not longer necessary to keep borrowing costs low. In Luxembourg said the European Central Bank President Jean Claude Trichet that excess exchange rates is bad for the global stability and he agreed with U.S. authorities that a strong dollar is very important for the economy. Before the end of the year, Jean Claude Trichet will travel to China with European Union Monetary Affairs Commissioner Joaquin Almunia to discuss about currencies, because the actual exchange rates are a big problem for the euro zone and worries the European Central Bank. Since the beginning of October, the currency pair has been trading in a bullish trend channel. 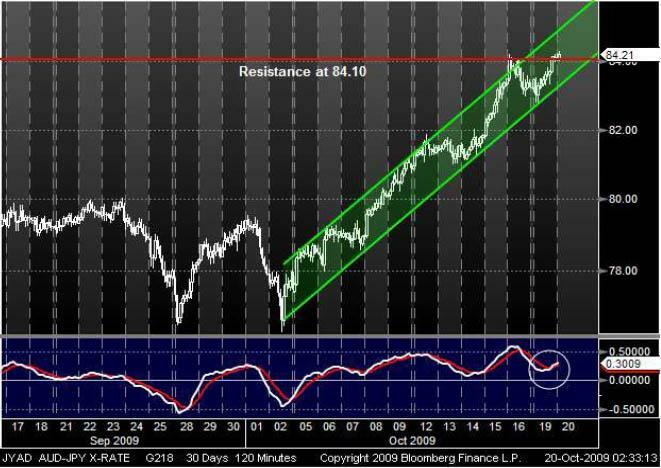 Recently, the AUD crossed its resistance at 84.10. One time before, the resistance was strong enough, but this time it seems as if the AUD could let its resistance behind him and continuing its trend channel. Also a crossing MACD through the signal line from below may support a bearish trend. Since the beginning of October, the EUR has been trading in a bearish trend channel against the AUD. Now, the currency pair touches the bottom line from the trend channel. Two times before when it did that, the prices recovered. 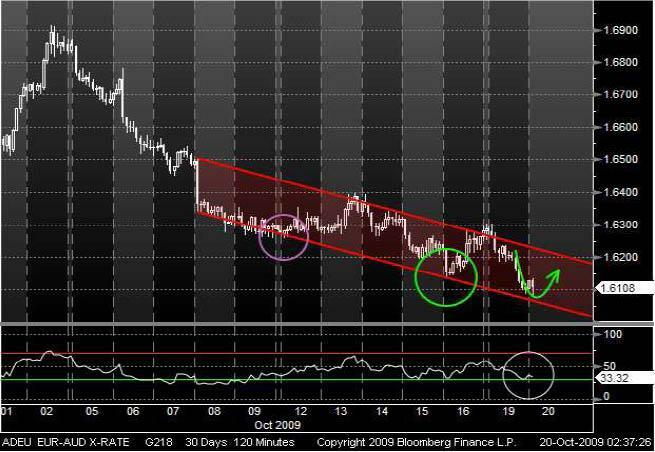 Furthermore the RSI may indicate an increasing trend for the EUR and could support a successful pull back.